Dreamlike Lights twinkling in the ocean. Museum you can learn firefly squids by directly touching them. The Museum is the only one facility in the world made as the symbol of culture, sightseeing spot of Namerikawa City surrounded by abundant and rich nature. The structure consists of glass-walled Market Hall and Restaurant Zone overlooking grandeur scenery of Tateyama Mountain Peaks plus Museum Zone revoking mysterious world and deep sea produced by eliciting fantastic lights. This is an experience- and- learn- by yourself- type of museum where you can touch and learn to see the Lights-emitting Show at the “Live Theater”, starting from “Sea of Deep Sea Wonders”, and ending with Firefly Squid plus its ecology to the mysteries of habitation in the Bay at the same time. The original wearing stuffed Character of the Museum imaging firefly squid and mysterious lights itself welcomes you introducing must-see places and firefly squids. You can spot the Character here and there in the House. There are a number of substantial displays and exhibits in this spacious Museum. This leaflet will introduce its displays and exhibits worth viewing and characteristics. Theater- and-spectators Integrated Live Theater offering a half moon water tank and screen combined and luminous fish lights show is periodically offered where you can enjoy firefly squid and deep-sea marine creatures up close. Touch Creatures Water Pools you can touch by your hands rare deep sea creatures from the Bay. (Humpback shrimp and such instead is on display during the period from June 1 to March 19 when firefly squid is not available). Please see as you can touch with your hands without haste and it’ free to take pictures. Interesting to experience iciness and purity of water taken from 333 meters deep off Namerikwa. 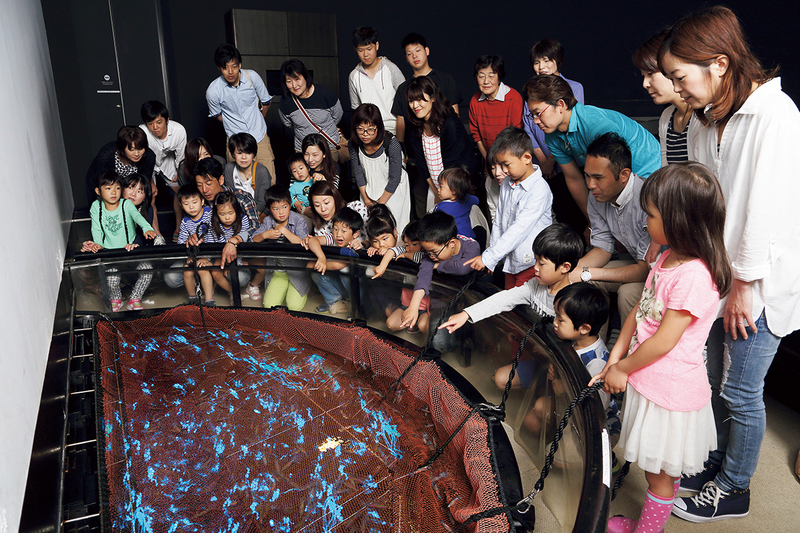 Moreover, during off season (March 20 to the end of May) you can touch live firefly squid with your own hands. Don’t miss this rare opportunity of observation with your own eyes and hands. In this Exhibition Hall an open-hearted place extending on the 1st floor of the Museum. The wonders of Toyama Bay are introduced centering on firefly squid using a full variety of exhibition techniques. Even children are able to enjoyably learn. Come visit us to the wonders and mysteries of the Ocean. On the mural of the Hall, displayed are “Full Anatomy of Firefly Squid” to enable you to enjoyably learn in detail. Explains the wonder phenomenon observed along the coast of Toyama Bay, You can also learn “Leaping ashore of Firefly squid” in detail in this Gallery.